November 19, 2012 - Bombardier Aerospace announced that the first wing shipment for its Learjet 85 jet has arrived at the Wichita assembly line and is now in the process of being readied for mating to the fuselage of Flight Test Vehicle one (FTV1). The Learjet 85 is the latest Learjet development program by Bombardier. The program was launched on October 30, 2007. The Learjet 85 fits between the midsize and the super midsize segments of the market. It will be the first Bombardier jet to feature a composite structure and will be Learjet's first composite structure business jet designed for type certification under FAR-25. The plane is expected to have a high-speed cruise of Mach 0.82 and a transcontinental range of up to 3,000 nautical miles. Bombardier reports nearly 60 Learjet 85 orders at a price of US$17.2 million, Flexjet announced it would be the initial launch customer. Alongside the arrival of the first complete Learjet 85 aircraft wing, the fuselage for FTV2 has successfully completed its integrity inspection. Installation of the nose, bulkheads, floor, windshield and door surrounds are scheduled to begin in the coming days. 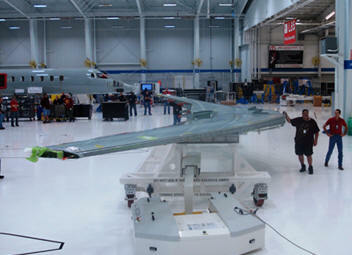 Once complete the main fuselage will be shipped with the aft fuselage to the final assembly line. The Learjet 85 aircraft lives up to its nomenclature with its sleek Learjet lines, legendary performance, and blends the newest technology to deliver an aircraft that will redefine the midsize segment with the largest, fastest and longest range Learjet aircraft to date. It can link Montreal with Caracas, and fly Montréal to Los Angeles. And with its Bombardier Vision Flight Deck offers pilots the most sophisticated cockpit in its class.